The two-way synchronization between a local .ml file and Google Calendar lets you see MLO tasks distributed over the calendar, together with the meetings from other calendars. 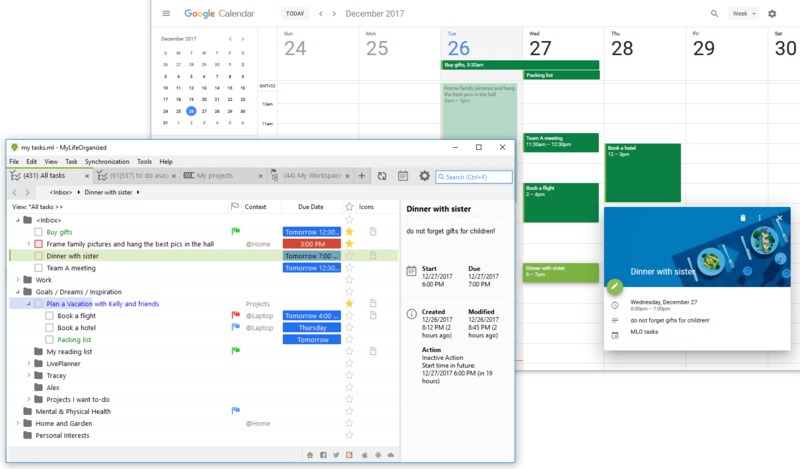 This way you can visually assess your load and, on top of that, managing events (like creating an event or changing its date) in the calendar you automatically manage your MLO file - any change you make in Google Calendar after the sync will be reflected back in MLO, and vice versa. Note: The connection process is managed by Google and your login credentials will not be transferred to MyLifeOrganized. Once done, the button will say "Connected". Tip: We highly recommend creating a new calendar to avoid confusion. Only events created in that calendar will be added as MLO tasks. The filter lets you manually pick out only necessary types of tasks to be synced with the calendar. Check the options you need. You may select a specific branch of tasks for sync to Calendar. Then, set another filter - sync tasks associated with a specific context or flag etc. Note: There is an option to show completed and hidden tasks in the calendar. If this option is not selected, after you complete a task in MLO and sync, the corresponding event will vanish from your Google Calendar. 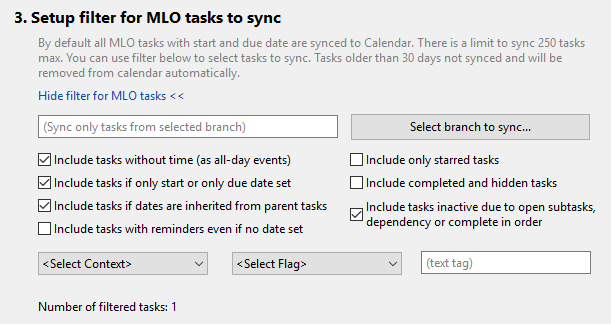 By default all MLO tasks with start and due date are synced to Calendar. But you may select to include tasks with either a start or due date. MLO will show you the amount of filtered tasks which are to be synced with Calendar. The counting is necessary due to a quantitative limitation. A conflict may arise if an even has been changed simultaneously on both sides: in MLO and Google Calendar. Choose the option you prefer more and it will override the events from the other side. When you are ready to sync, click the corresponding button on the toolbar. Only one .ml file should be synced with the same Google Calendar. Another .ml file should be synced with another calendar. If there is a duplicate of this file synchronized through the Cloud on another computer, do not sync that .ml file with the same calendar in order to avoid the duplication of tasks. There is a quantitative limitation: not more than 250 MLO tasks can be synced to calendar. Tasks which start/due date is older than 30 days are not synced and will be removed from the calendar automatically. Tasks that no longer meet the sync criteria will be removed from the calendar. The data that correspond the most up-to-date sync settings override all previous data. For instance, you put a checkmark for “Include only starred tasks”. After synchronization, the calendar will not show tasks without a star from MLO (the corresponding events will be deleted from the calendar), even those that have been displayed there before synchronization. This is because the condition is no longer valid. Any events created in the selected calendar will be added to the folder you selected in MLO. If no branch is selected for sync events from the calendar will be placed to Inbox. After syncing events from the calendar appear in MLO along with a title and description (which is placed to notes), start/due date and reminders. If you set up a reminder in MLO after the task has started, then in the Google Calendar the reminder will be placed at the beginning of the task since Google Calendar supports adding reminders only before an event start time. There is a daily limitation of 500 requests to be sent to Google Calendar from a single user. Exceeding the limit results in disabling the synchronization for this day on the side of Google. That's why the sync process is manual now in MLO.